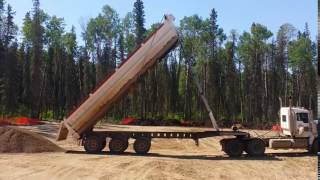 Hauling and Excavation Services Edmonton and Alberta | Jay Sidhu Transport Ltd.
Jay Sidhu Transport Ltd. is a COR certified Company with workers proud to provide a professional service. We strive to maintain a high rating standard in our Profession and welcome the lower Insurance and WCB rates. With our HSE Program in effect, our work standards include following the rules, regulations, laws and bylaws - keeping up to date on information provided by: Alberta Construction Safety Association, Partnership in Injury Reduction Program, Alberta Transportation and Transport Canada. The Management Team with Jay Sidhu Transport Ltd is ‘hands on’, ‘feet on the ground’. No matter how complex or simple the excavation is, we approach it with high levels of professionalism and commitment. We understand our client requirements and work to meet them every step of the way. Excavation is done in an environmentally friendly, cost effective, and timely way when you hire our Edmonton excavation services. A professional excavation services company will have good references and a track record that they will be proud to showcase to you as and when needed. They will have all the necessary industry affiliations which show you that they are up to date with the latest in industry trends and regulations. The company will offer a wide range of packages that are customized to the client’s requirements and budgets and will also be able to offer some value-added services that set them apart from the competition. The company has a good clientele and has successfully completed many projects with good results. They have state of the art equipment for the excavation. Their staff and personnel are well trained, professional, and are well aware of all the safety regulations and procedures in place. The company keeps an open line of communication with clients so they know exactly at what stage the work is and what the progress of the project is. Our Weight Truck Scale Edmonton enables trucks to be weighed before they go for stock piling.